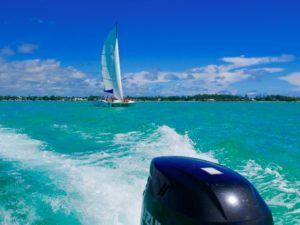 When arriving in Mauritius from a grey and rather pale, deep freezer cold Europe your eyes are in for a colour shock, big time. 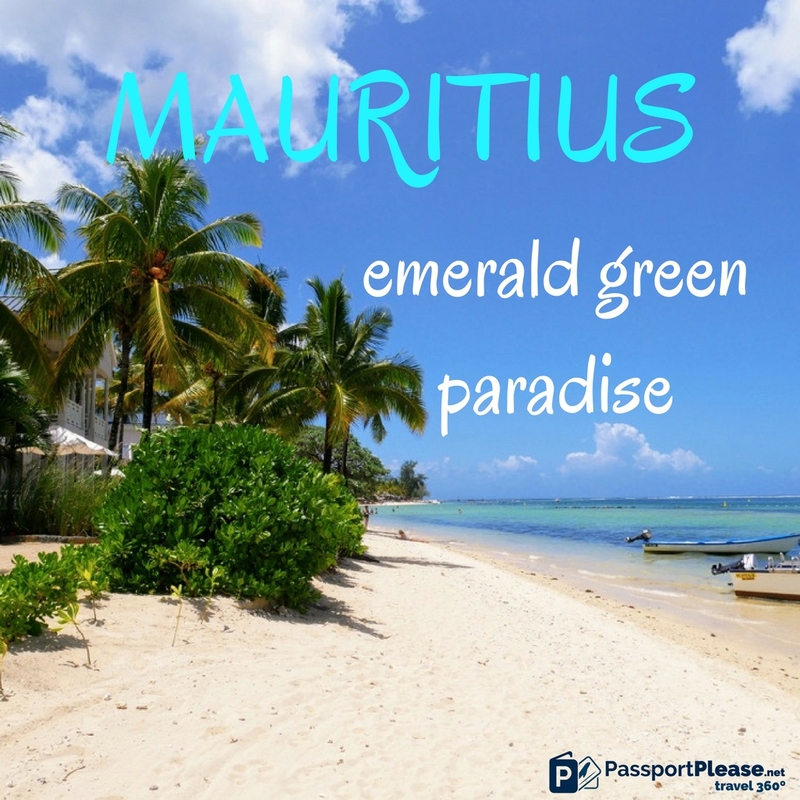 Shades of green and blue, you didn’t even know existed, are dotted with colours from the rest of the pallet and this colourful patchwork just makes you want to dive into the magnificent island of Mauritius and soak up every bit of it. 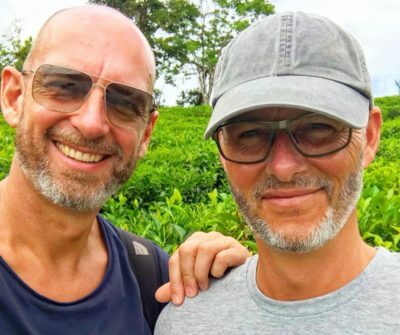 When we travel, we do not necessarily go for “postcard perfect destinations” but after places where we can get a glimpse into everyday life as it really is and not the perfect polished version. 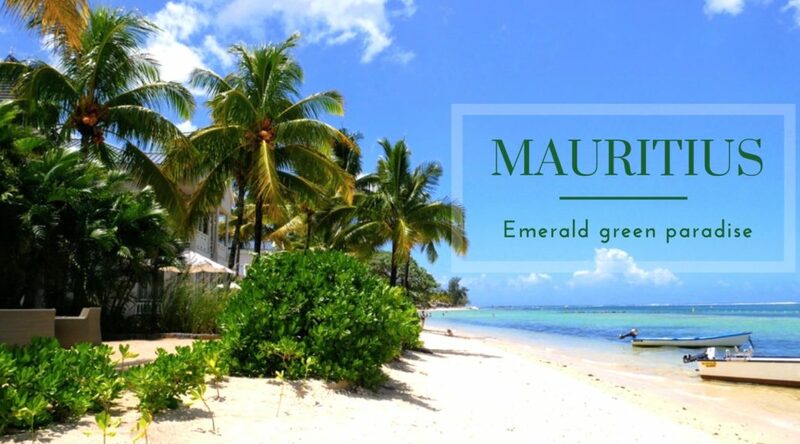 We were a little nervous if Mauritius would turn out to be too polished and groomed. 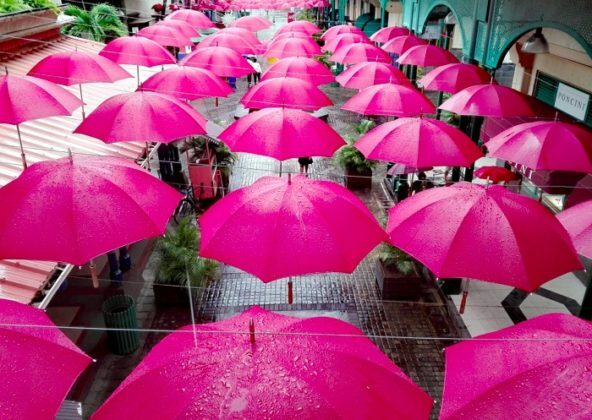 Where everything would be about 5-star hotels, high-end shops and posh restaurants. 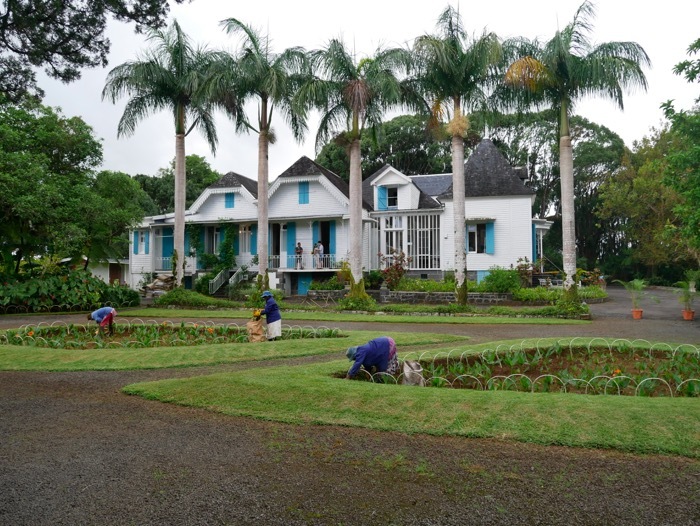 We were so pleased to find out that Mauritius is a vibrant, colourful and genuine society. A country that generously shares its treasures with its visitors. 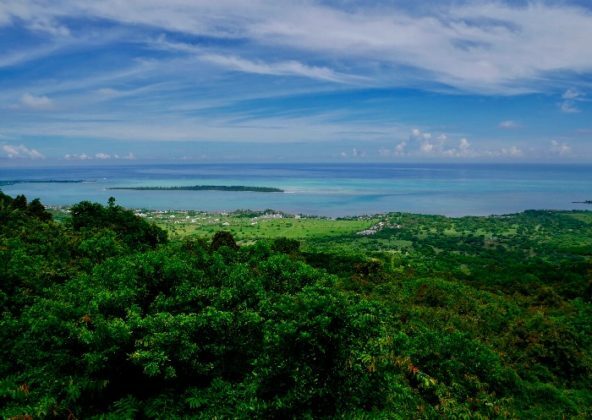 We totally get why Mark Twain thought heaven to be copied after Mauritius. 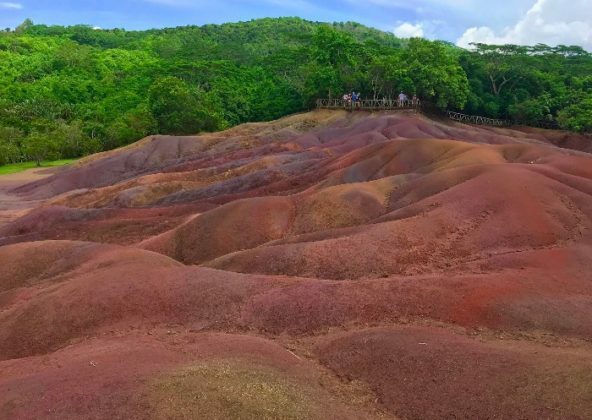 Where ever you go Mauritius welcomes you with amazing colours. 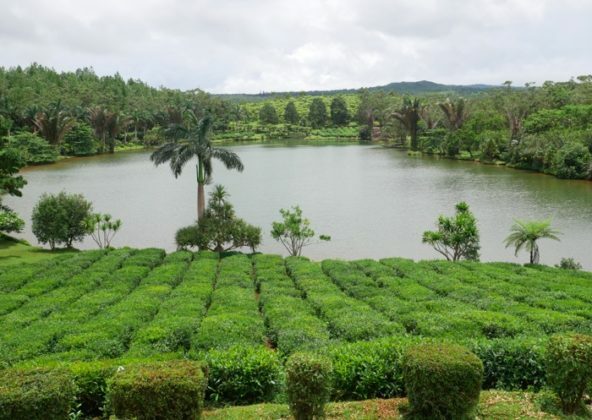 You are greeted by every shade of especially green and blue. 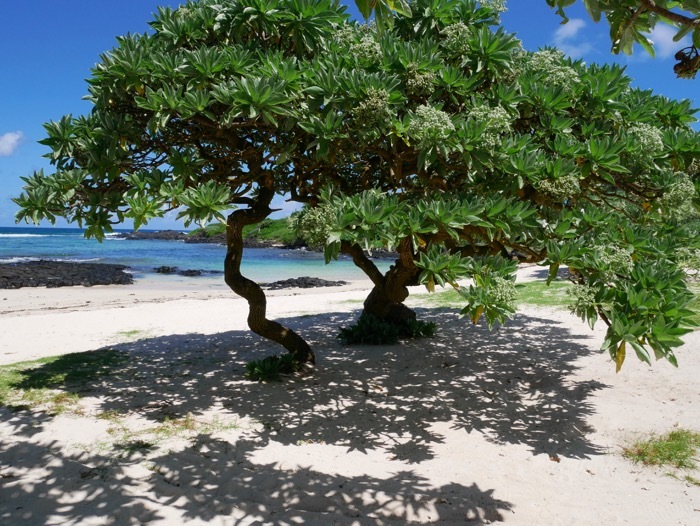 There are so many extremely wonderful places on the island and it can be difficult to decide where to stay. We went in February and it was partly the weather forecast that made the decision for us. .We stayed in Flic en Flac on the west-coast. 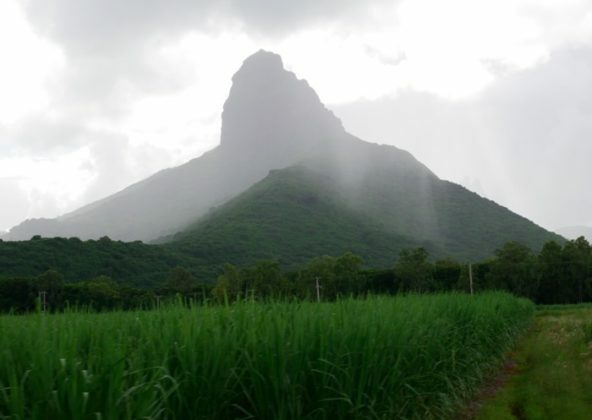 According to Met-service, we could hope for less rain here as February is in the middle of the rainy season and they do get quite a lot of rain during the Mauritian summer months. 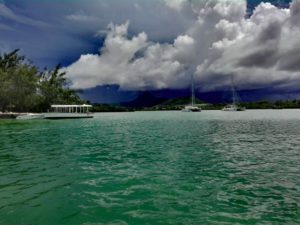 We also went for Flic en Flac because we would find some of the best snorkeling here, and we sure did. 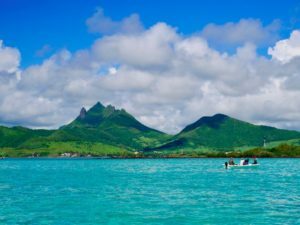 Mauritius amazing underwater world will WOW you big time. 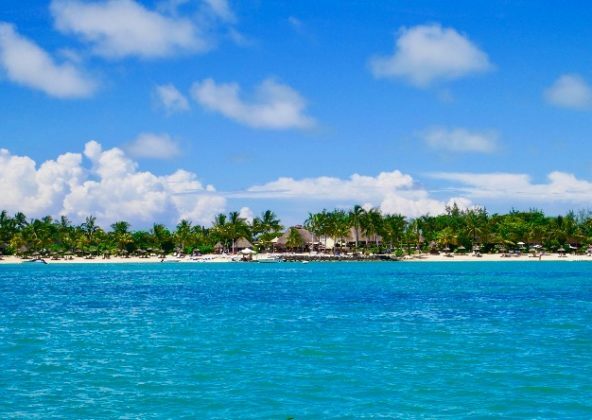 Flic en Flac has some of the best dive and snorkeling spots on the Island. 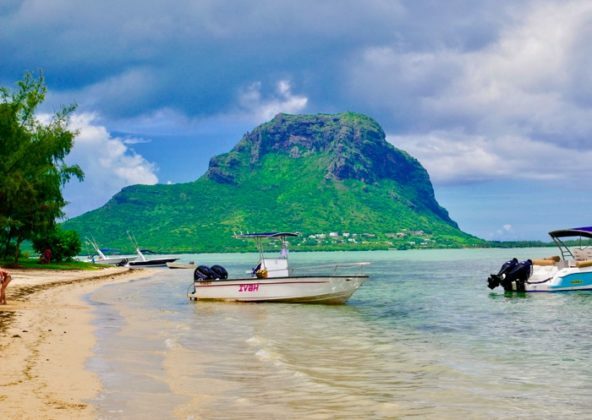 Mauritius isn’t that big and in fact, you can stay anywhere. With a rental car, you can quite easily get from a to b. 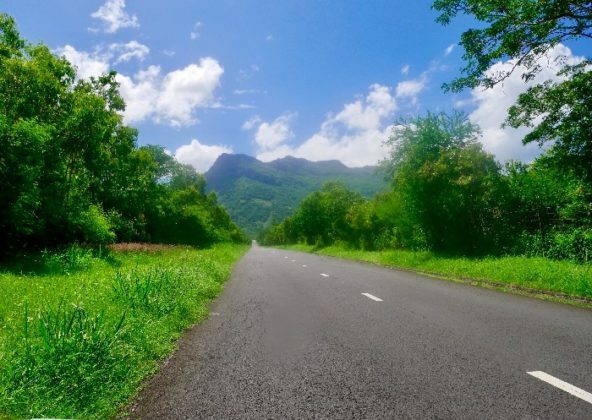 The road network is good, the roads are in a good shape and the Mauritians are careful drivers. 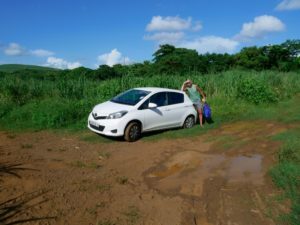 Car rental should be done when in Mauritius and not via the internet from home. This will save you A LOT of money. 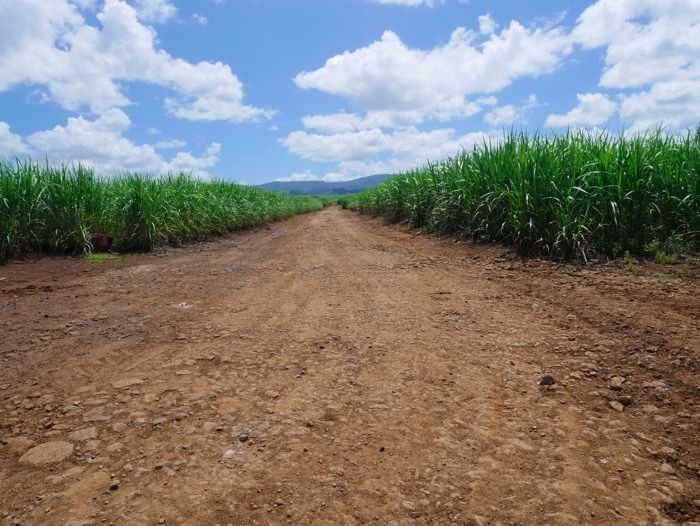 Even though most of the roads on Mauritius are excellent you will now and then end up on a dirt road like this. No need to panic it just adds an extra dimension to the experience. We loved road tripping in Mauritius. The car made it possible to explore remote secluded villages, pristine paradise-like beaches, beautiful waterfalls and untouched nature. And with the car, we could always escape the next thunderstorm. A tropical storm is being formed in the distance. Within a few minutes, the blue sky can suddenly be transformed into a dramatic cloud cover. An absolute insider tip, when road-tripping in the southern part of the island, is to visit the amazingly beautiful beach of St. Felix. 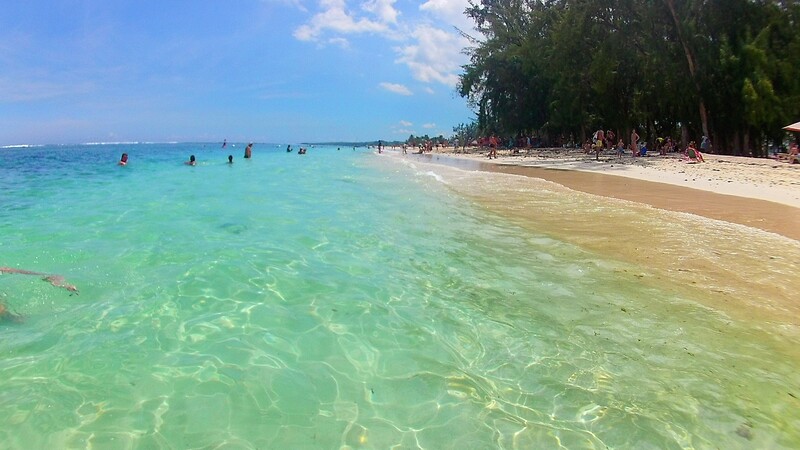 You will have this white sand beach with crystal clear water almost to your self and the snorkeling is perfect. The beach is public with a few street food stalls and restrooms. 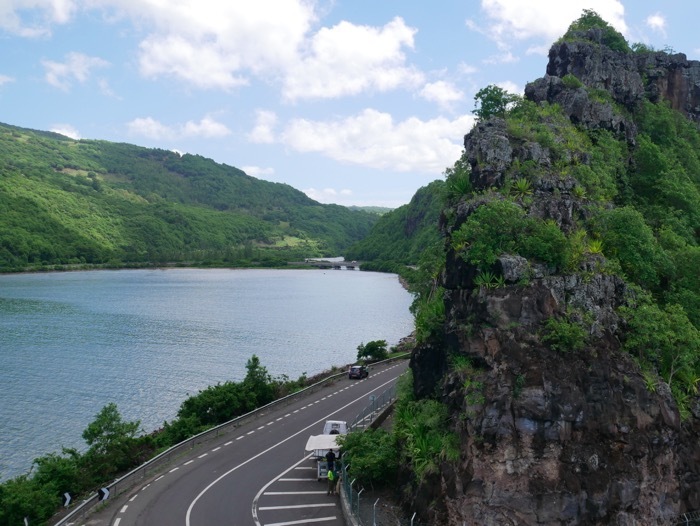 The southern coastal road is an attraction itself. 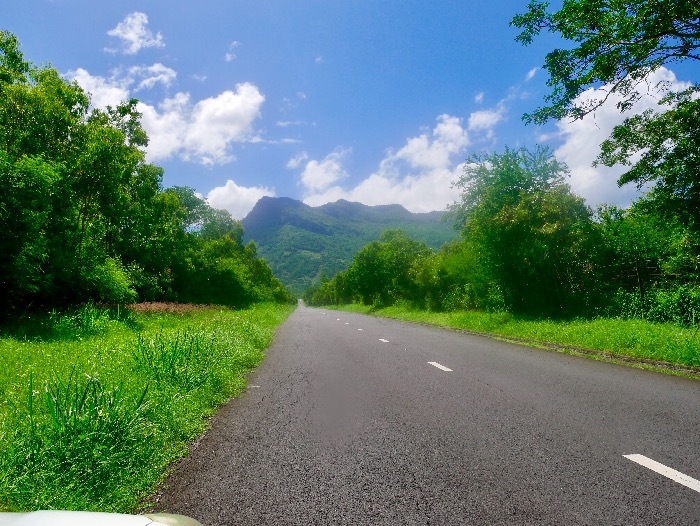 From the road, you have amazing views towards Le Morne in the west. 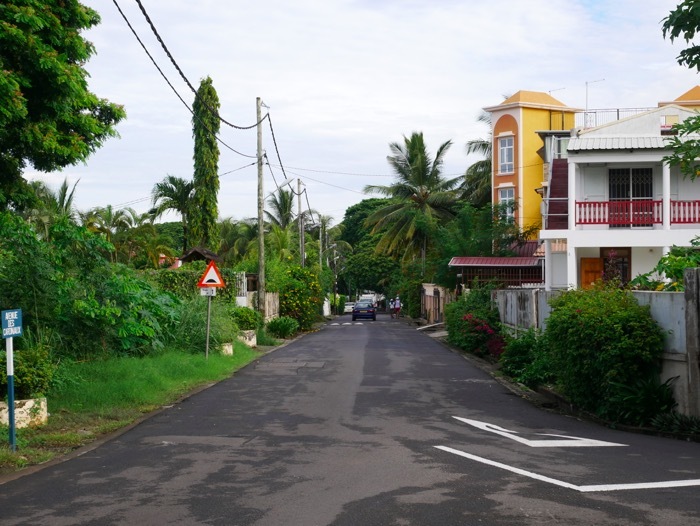 It will take you through small picturesque fishing villages and give you an unobstructed view of the Indian Ocean to the south. 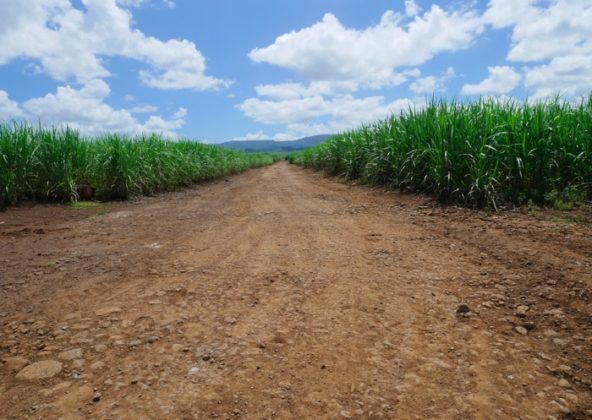 To the north you now and the get a glimpse of the green immensely beautiful mountains and the endless rolling sugar cane fields. 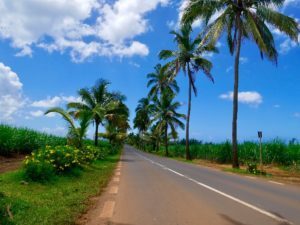 Along the road, you will pass through small vibrant villages with a lively local life, small stalls selling mouthwatering fruits and seafood as fresh as it gets? 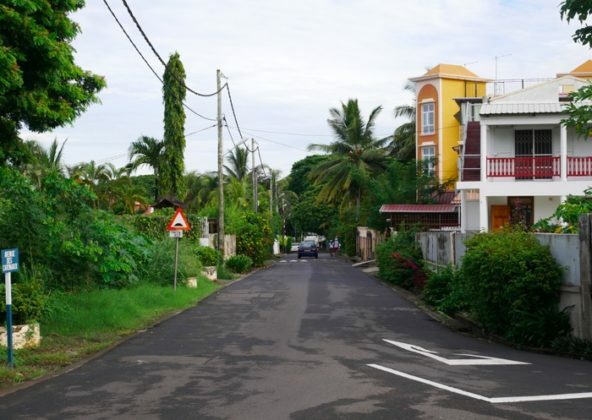 You will meet smiling welcoming islanders and women dressed in colourful beautiful saris. Now and then the road is lined with majestic tall slim coconut palm trees. We cant count how many times we just looked at each other and said WOW. 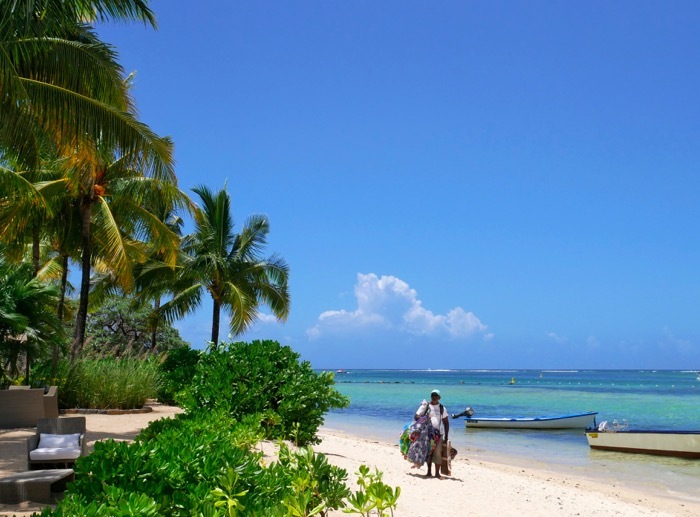 Majestic palm trees along the beautiful coastline of Southern Mauritius. 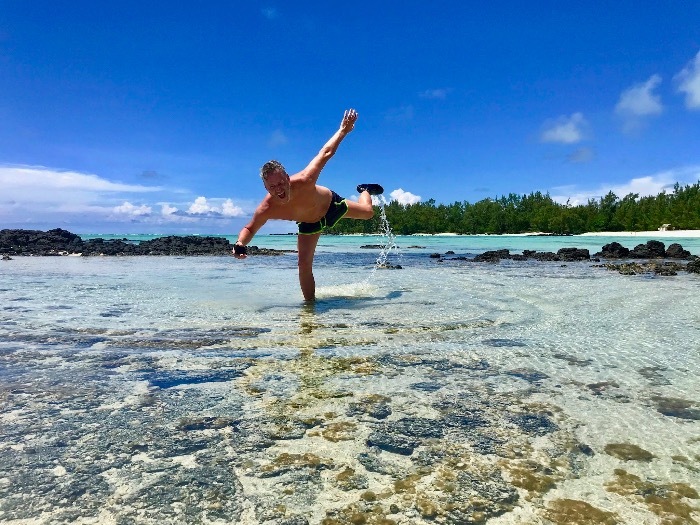 No matter how surprised we were over Mauritius’s landscape and the local population, we were most fascinated by the beautiful beaches and the crystal clear warm seawater. And of course the immense variation of underwater life. 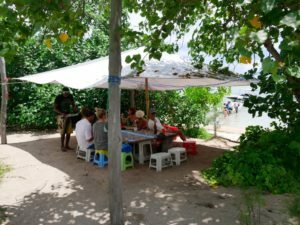 Flic en Flac being our base we had the best opportunities to explore the marine life. 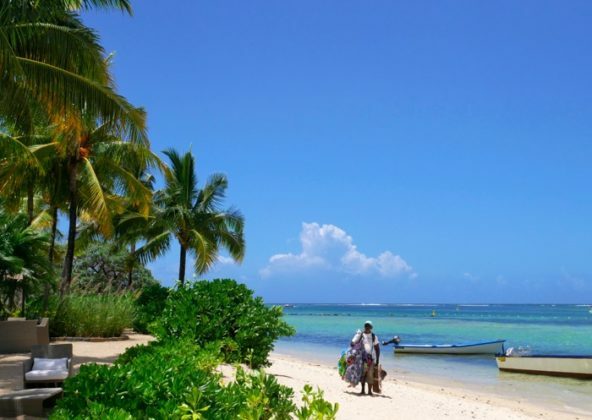 The beach of Flic en Flac is said to be one of the best in Mauritius and is almost 7 km long. 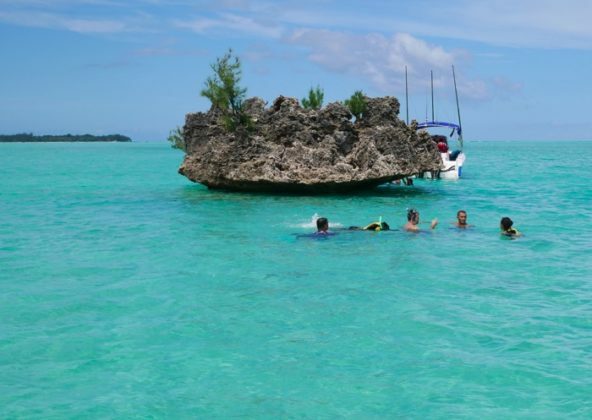 You will find some of the islands best dive sites here and in the emerald lagoon, there is excellent snorkeling. 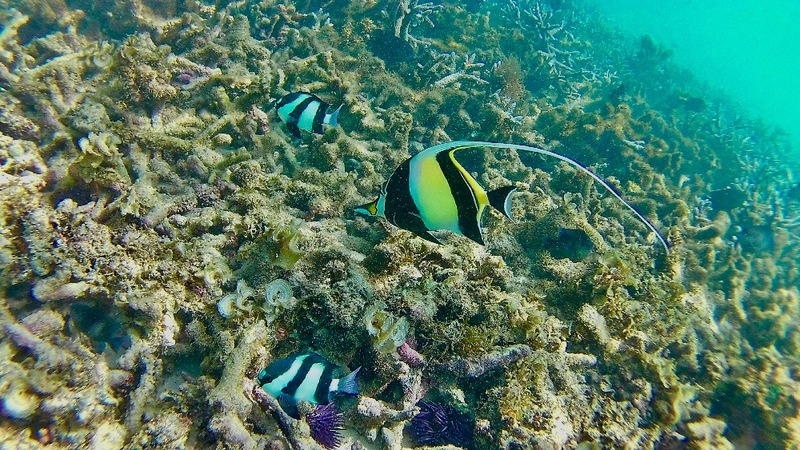 However the quality of sand, the clarity of the water and the number of corals and different fish vary quite a lot. 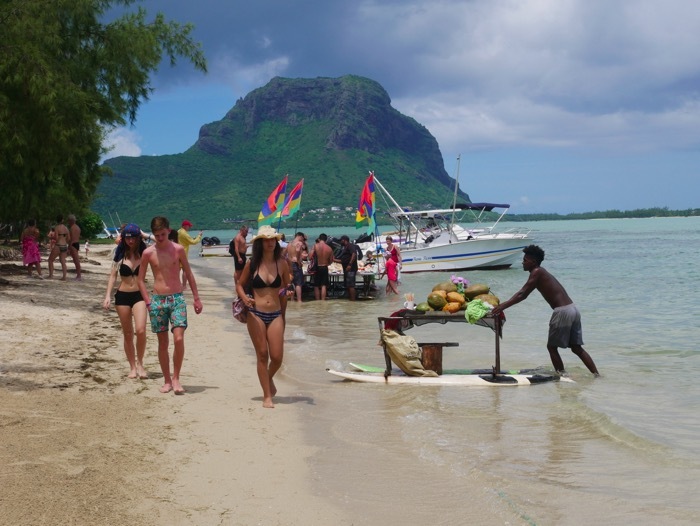 We found the absolutely best stretch of beach with the best snorkeling to be the part between the police station in the north to the public beach where you get the first glimpse of Le Morne in the south. 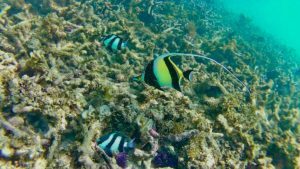 Here the visibility is great, the water is calm, the sand is smooth and the underwater life is diverse and stunningly beautiful. 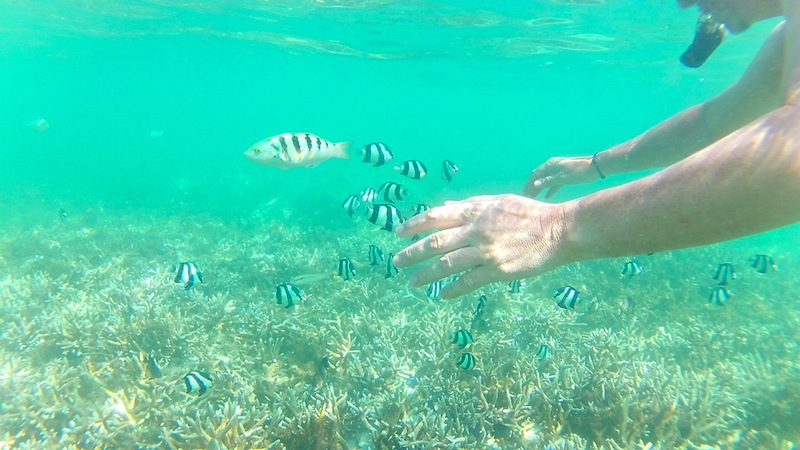 The best time for snorkeling is at high tide. Do remember to wear some kind of swim shoes, sandals or boots. 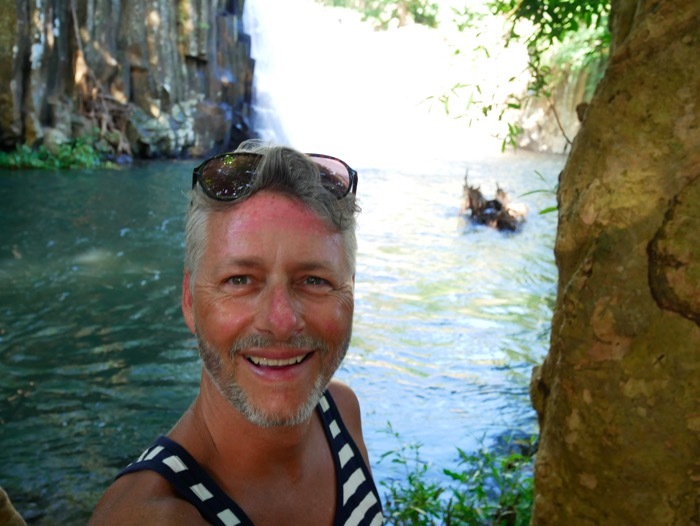 There are a lot of corals, sea urchins and poisonous rock fish. 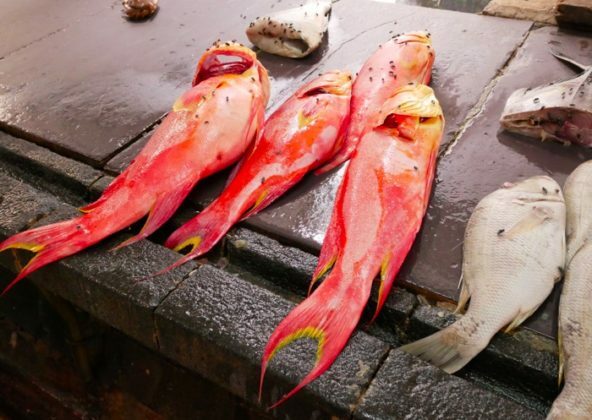 Don’t touch the corals and underwater rocks some of the poisonous fish are experts in camouflaging themselves. 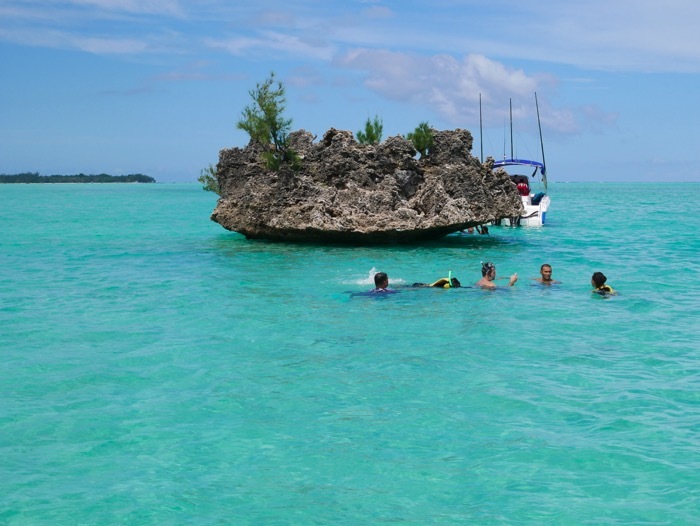 Snorkeling in the warm, crystal-clear waters of Flic en Flac. 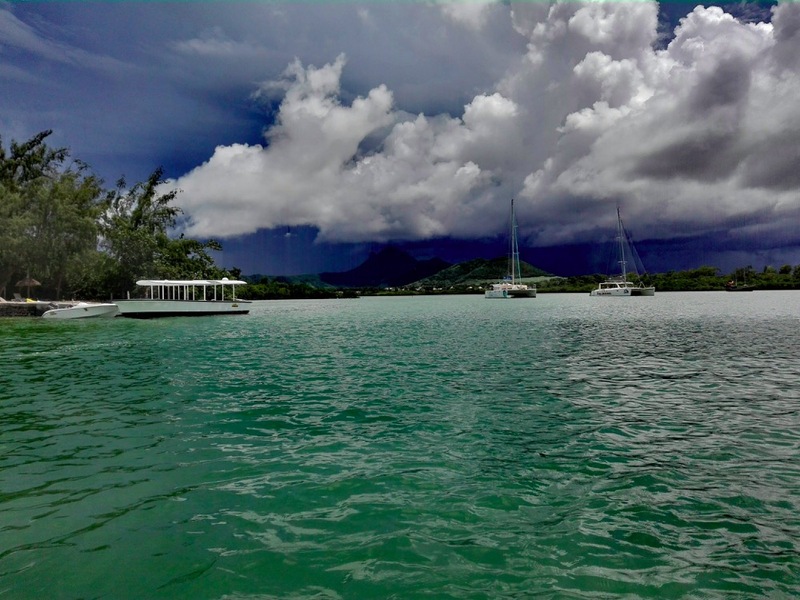 Over and over again, we were amazed by the lagoons diversity. 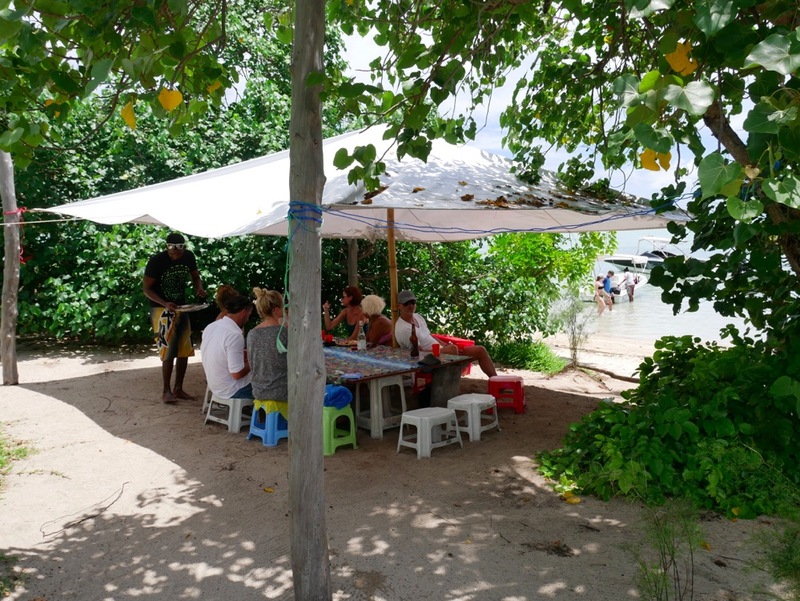 When tired of swimming and snorkeling and you’re overcome by starvation there are a lot of very good food stalls at the beach where you get delicious street food at a very low cost. 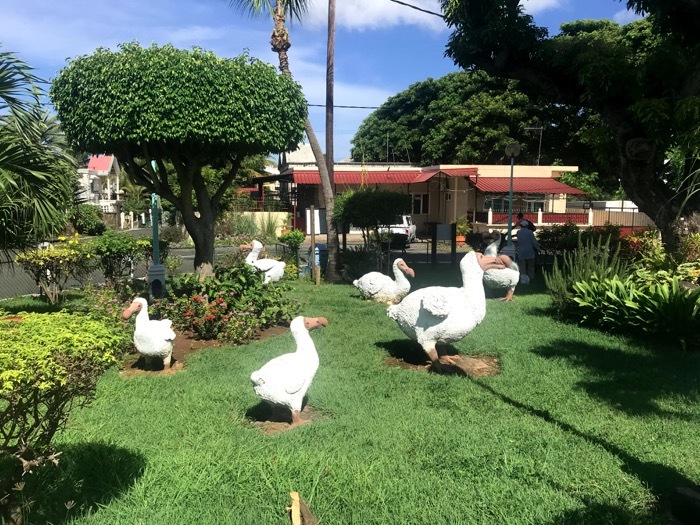 You will also find a handful of nice restaurants in town serving great food whether you are in for Thai, Indian, European or local Creole dishes. We do recommend Leslie’s for local Creole dishes. Sunset Garden is set in a beautiful green tropical garden and has a great live band on Saturdays and the best Thai food you get in the small outdoor restaurant, Sawadee. It’s easy to find really good street food at the beach. 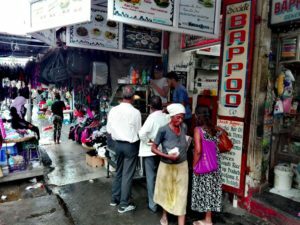 In Flic en Flac you will find several small stalls selling delicious fresh homemade street food and it will only set you back a few rupees. However the absolute best meal we didn’t get in Flic en Flac but in Beau Vallon where we stayed at Le Jardin de Beau Vallon. This fantastic little gem of a guest house gets our warmest recommendations. They offer 5 small wooden cottages in a tropical garden and at night you can dine at their stylish restaurant set in an old colonial style wooden house while listening to very good live music. And they serve food to die for. Try their lamb-rack with rosemary and honey followed by a coconut mousse or a vanilla infused creme brûlée. This will catapult brain and body directly into a state of total happiness. 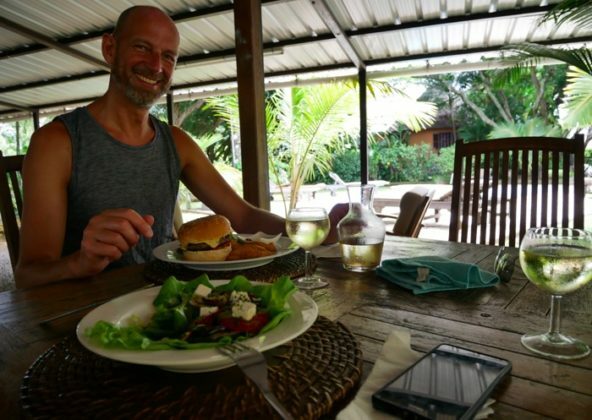 The restaurant at Le Jardin de Beau Vallon in Mahebourg will pamper you BIG TIME. 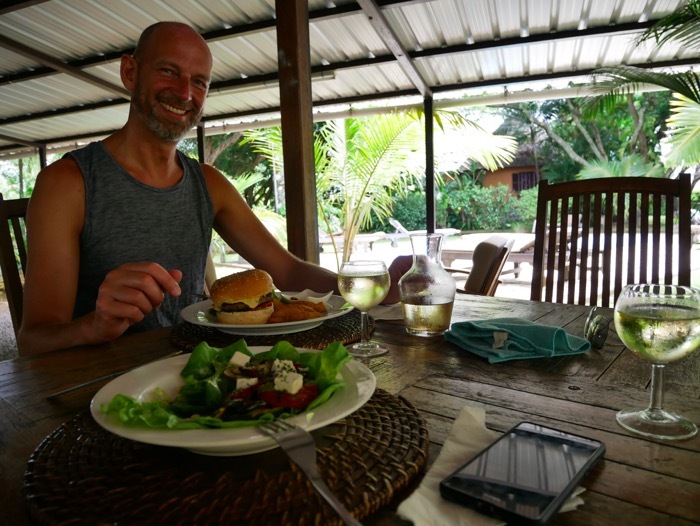 We absolutely fell in love with this little gem of a guesthouse and restaurant. 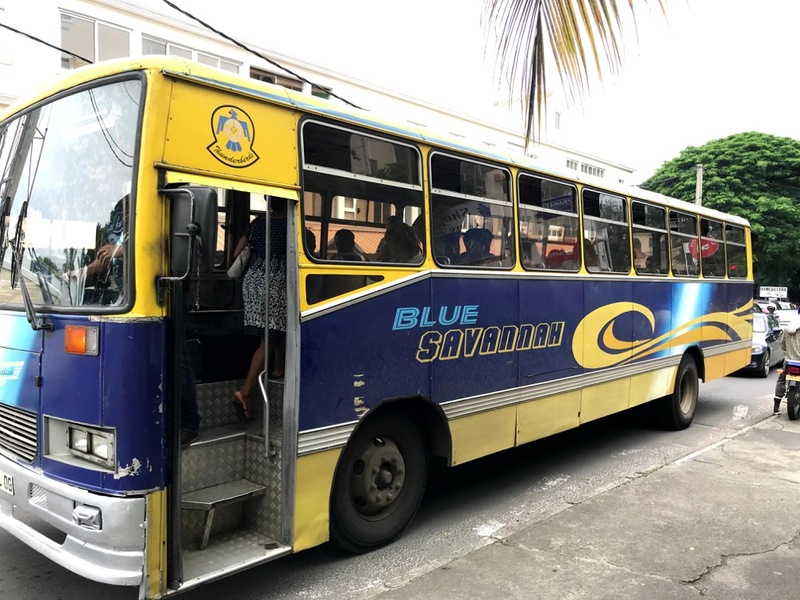 Another fun way to get around in Mauritius is by using the local buses. 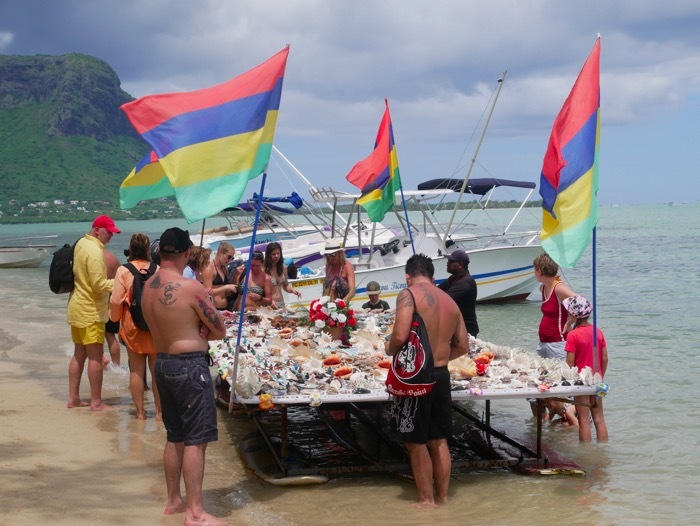 They are often packed, they don’t set any speed records and they stop every 2 minutes but its a great way to get a glimpse into daily life and meet locals. There is no countrywide bus service but a lot of regional ones. You will have to change at one of the main hubs. 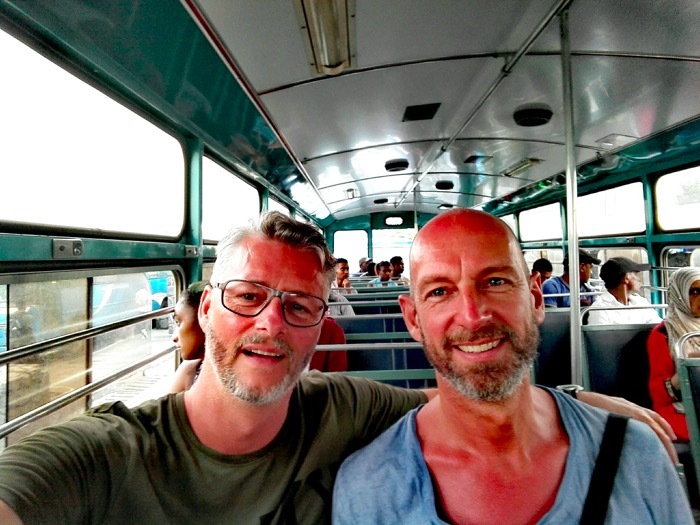 Bus service is frequent and a very cheap way getting around the island. Use the bus because of the fun of it and not as your general transportation. And do notice the amazing names on the buses. Rarely have we met such inventiveness. How about taking a ride on The Parrot Princess, The Chicago Express, Speedy Gonzales or even Jack Sparrow. 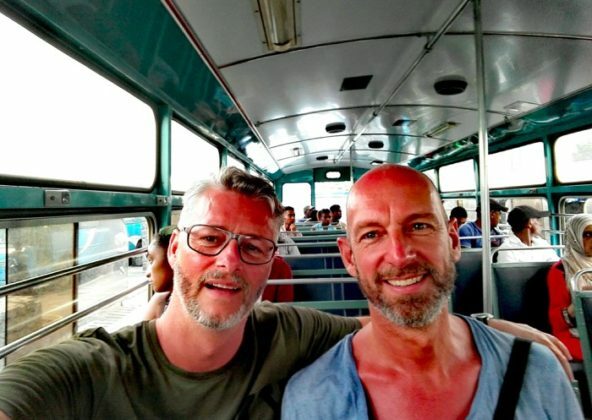 Take the local bus……you are in for a fun ride. While on the route you will have so much fun looking for street names. How about living on Kung Fu Lane, Dignity Street or how about Hitchcock Avenue? If you are planning to visit the capital, Port Louis, take the local bus. The traffic in the city is quite hectic and you are likely to get stuck in traffic jam. 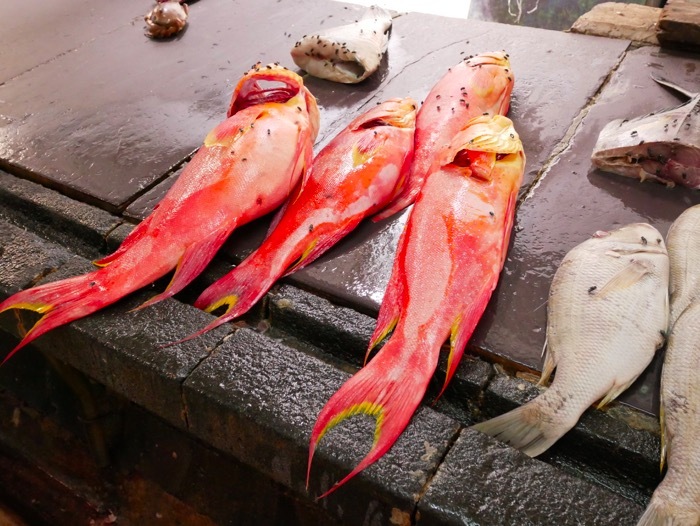 We do not think Port Louis has a lot to offer its visitors but if you find time in your program then you should definitely visit the city’s central market. 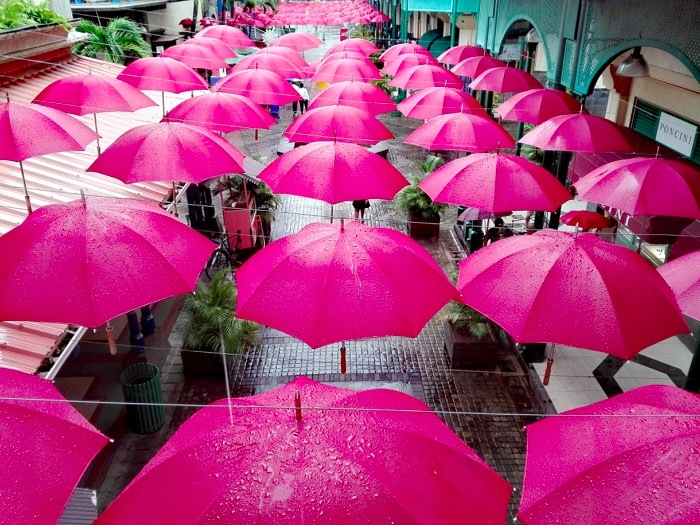 The Central Market in Port Louis tickles all your senses. 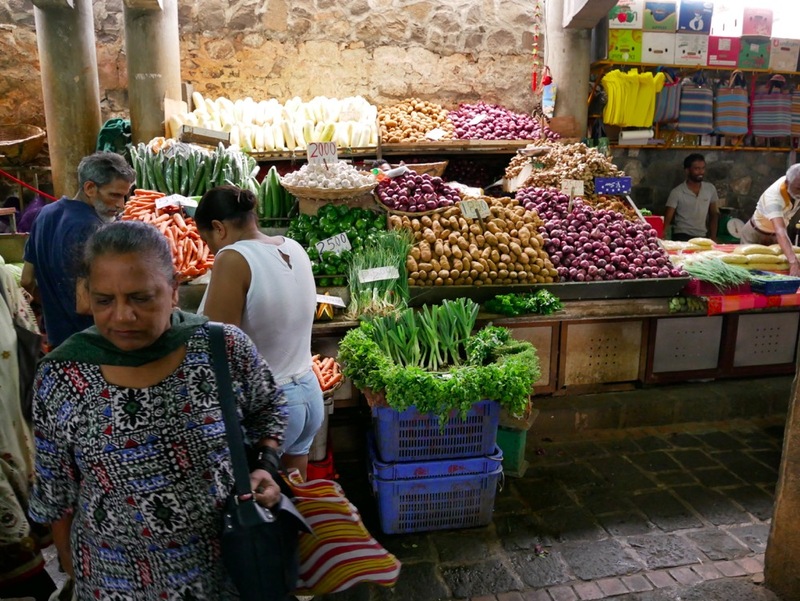 The central market is the largest in Mauritius and you will be greeted by a bustling trading life. 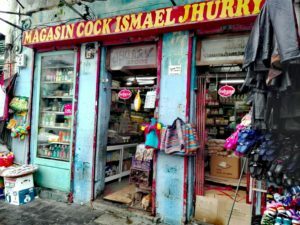 This is where the local population makes their daily purchases of fruit, vegetables and meat. 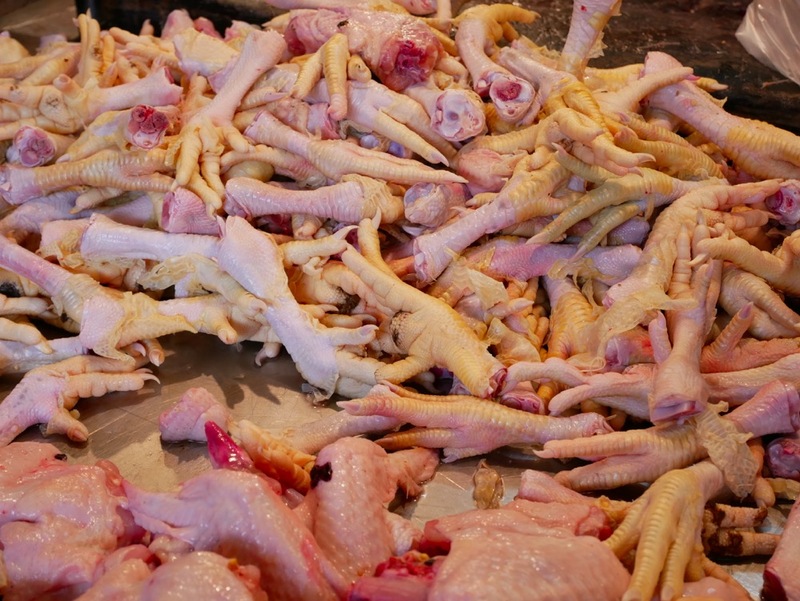 In the big halls, there is a cacophony of different sounds and the negotiations on the right price for a kilo of mangoes or chicken feet are fun to follow. When you are done walking around the large market halls, spend some time in the streets adjacent to the market. 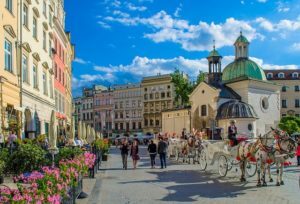 Here you will find an exciting street life with small stalls, lots of quirky shops selling all kinds of goods, colourful local merchants, housewives on shopping sprees and business people looking for lunch. The sound level creates an absolutely wonderful soundtrack for the lively spectacle you meet in the small streets and alleys. This is local life at its best. One of the small quirky shops found in the streets of central Port Louis. 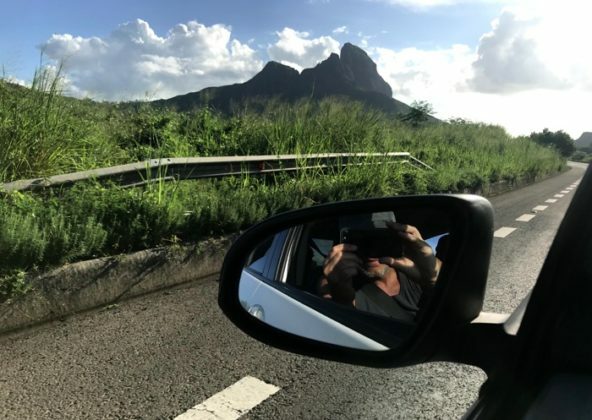 Besides the option of car rental and public bus, it’s also quite common to rent a car with a driver when visiting Mauritius. It makes good sense at least when you are planning to visit some of the islands rum distilleries. And there are for sure a few worth visiting. 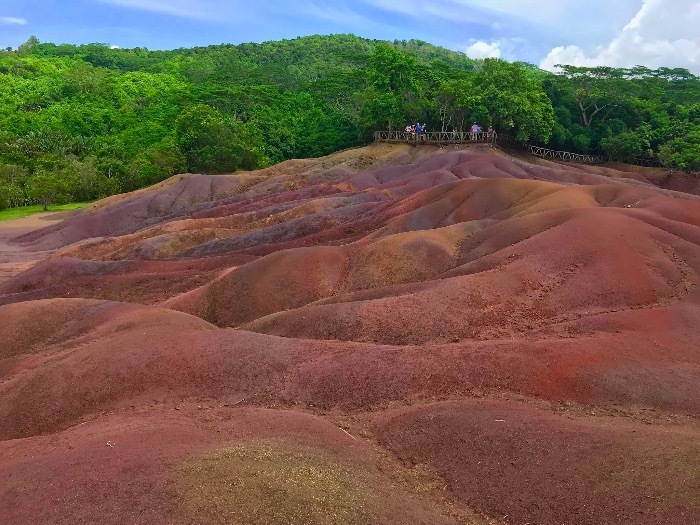 Our top pick has to be the Rhumerie de Chamarel situated close to the small hillside village of Chamarel. 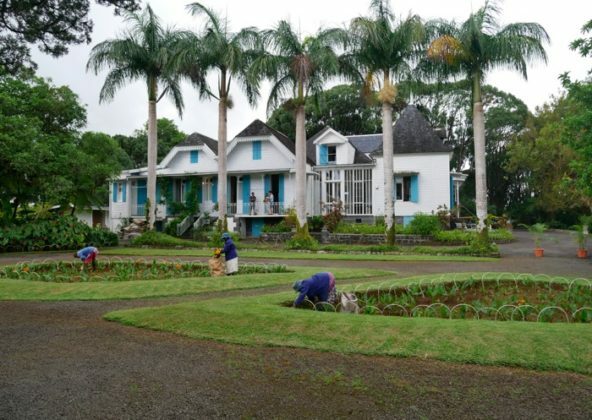 This small village is known throughout Mauritius for its very excellent eating scene. You can choose between a lot of small family run restaurant and they will treat you well. We recommend lunch at La Citronelle where you have to try their very delicious palm-heart salad. 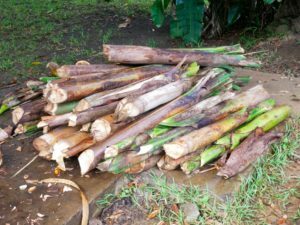 Newly harvested palm trees. 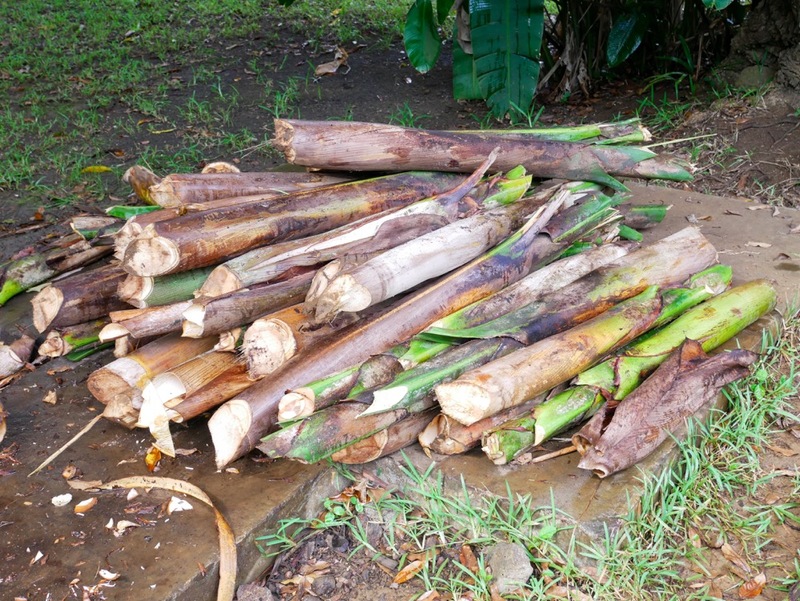 The inner core and the growing bud of certain palm trees are a delicacy and often used in Mauritian cooking. We tried several different dishes with palm hearts and loved their crunchiness. 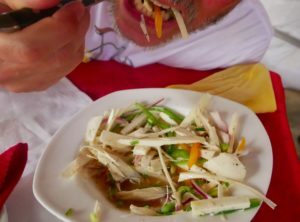 Attacking a very delicious palm heart salade at La Citronelle, Chamarel. 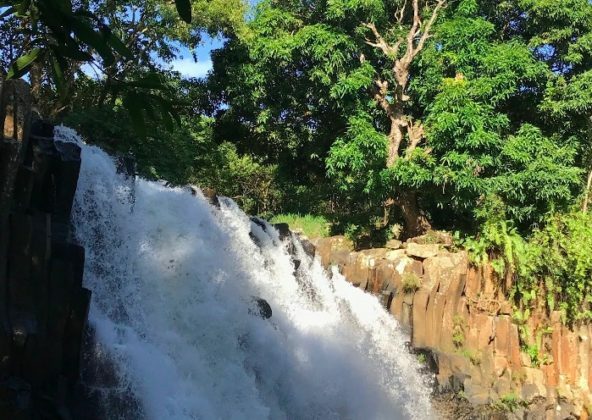 The rhumerie itself is only a few kilometres out of town and is situated among the amazingly beautiful hillside sugarcane plantations. 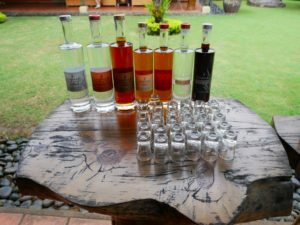 The rhumerie opened in 2008 and is showcasing their special ecofriendly rum making process. 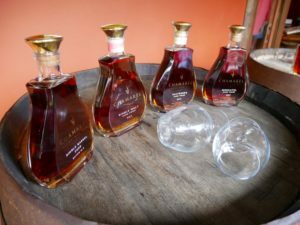 When the entrance fee is paid you get a tour of the factory, stories about rum making and finally a fairly extensive rum tasting. After your tour at Rhumerie de Chamarel you are invited to join a tasting. That’s why a driver comes in handy. There is a possibility of some dizziness after having tasted 7-9 different kinds of rums. If you after the mandatory tasting still haven’t had enough of cane juice its possible to join your guide at the bar and for a small fee try Chamarels more exclusive bottles before visiting the store. But be aware, the rum is very overpriced here. Do buy your rum at the local supermarket instead. They usually have a nice selection of locally produced rum. Chamarel produces many different rum types. For a small additional fee, you can join your guide at the bar and taste some of the more exclusive bottles. When in the Chamarel area you also have to drop by the Chamarel Waterfall. 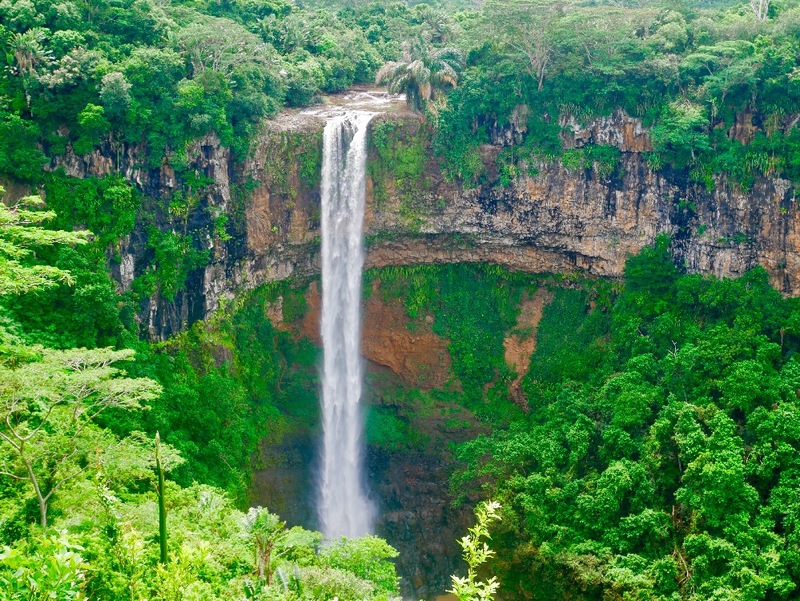 Its the tallest fall in Mauritius and has a single drop of more than 95 meters and is incredibly beautiful. 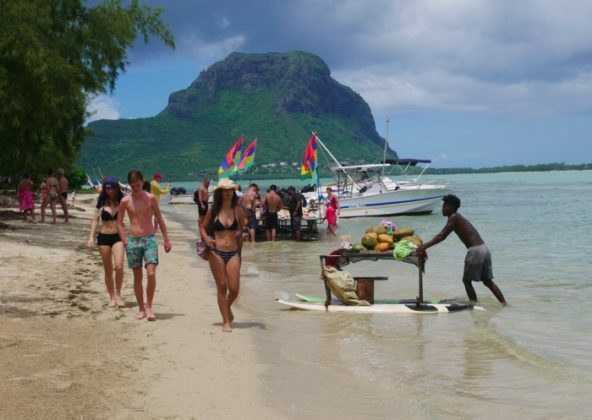 When going back to the coast be sure to take the scenic route from where you get jaw-dropping views of Le Morne, the south coast with the fantastic coral reef and Ile aux Benitiers just off the coast. In addition to the comfort of renting a car with a driver you also get the possibility to pick the drivers brain and get a lot of insider information. And its cheap, a whole day will only set you back 60 Euros. 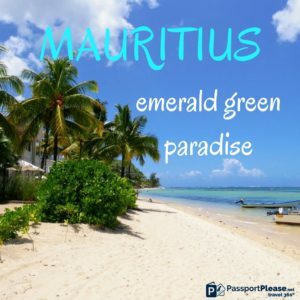 PassportPlease went on road-trip in Mauritius. Read about it here. 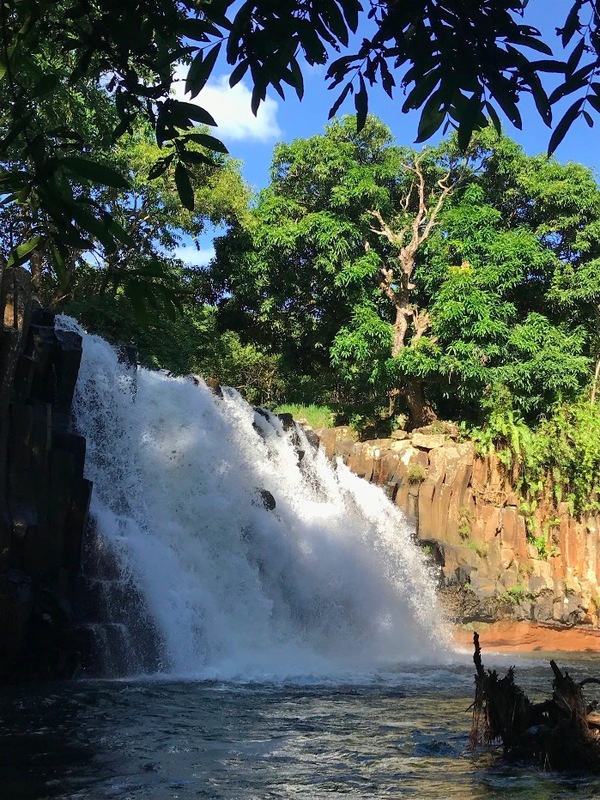 The fascinating Chamaral fall is formed by the St. Denis River and is surrounded by the lush vegetation of Black River Gorges. 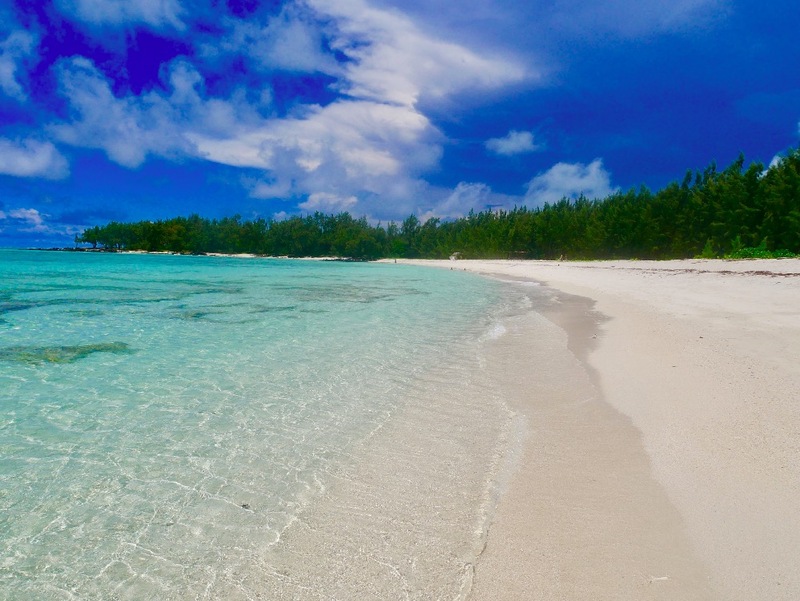 The waters surrounding Ile aux Cerfs has the most stunning aquamarine colour and just invites you to plunge in. The island’s interior is lush and in the distance, you can see the dramatic emerald green rugged mountains. We couldn’t help feeling having found a piece of paradise on earth. 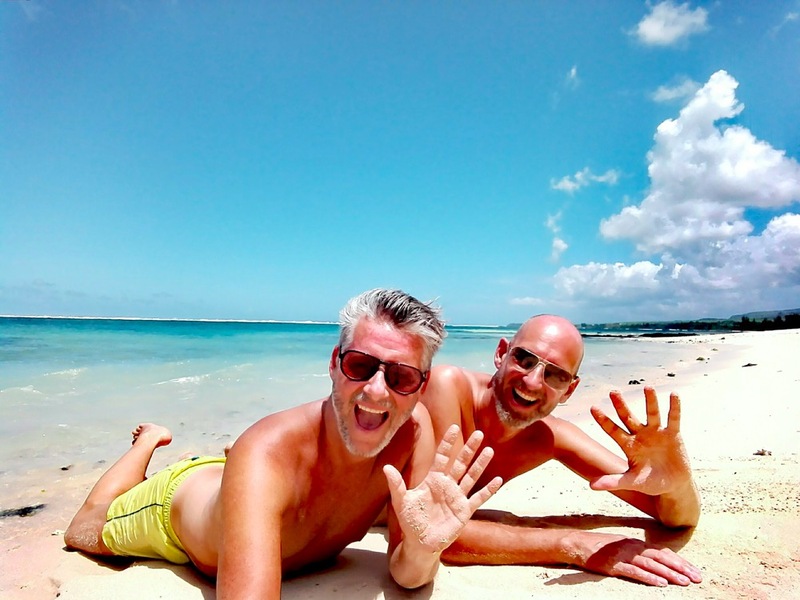 After spending some days on the road the longing after white sandy beaches and crystal clear warm seawater slowly began to crawl under our skin. We went east and took a speedboat to Ile aux Cerfs. 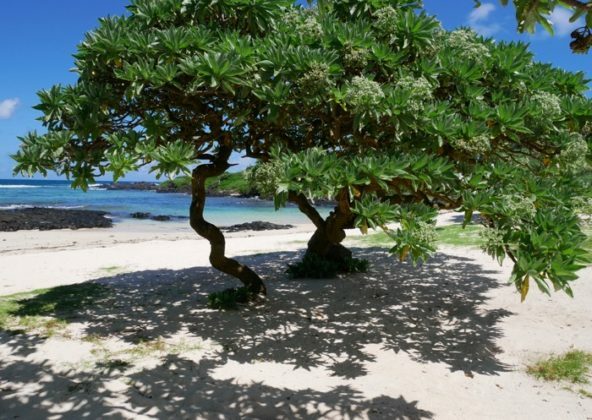 Here we found a postcard-perfect tropical island. 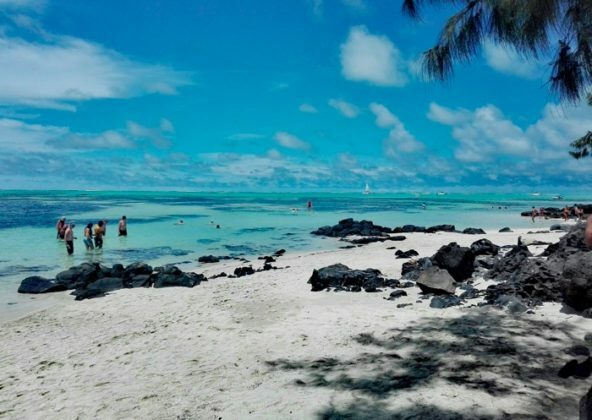 In February when Mauritius is on its way out of peak season you only have to walk 5-10 minutes and you will have the dreamlike paradisiacal beach almost to your self. Lying under the coconut palm trees, looking at the pristine almost blinding white sand and tap-clear water you truly get a sense of paradise. After hours of total enjoyment, the day ended with a barbecue directly on the beach. Not a single cell in our bodies wanted to leave this Nirvana. Whats not to like. Less than 10 minutes walk from the jetty you will find a pristine white sandy beach with almost Gin clear lukewarm water. 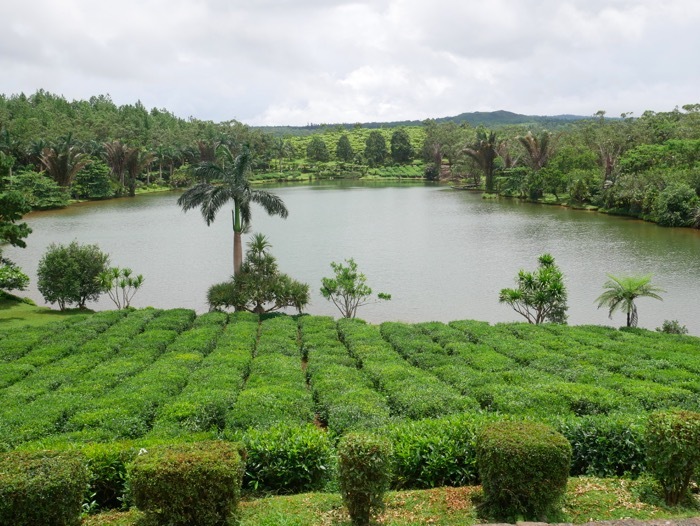 It was more than difficult to drag our self away from this Nirvana. 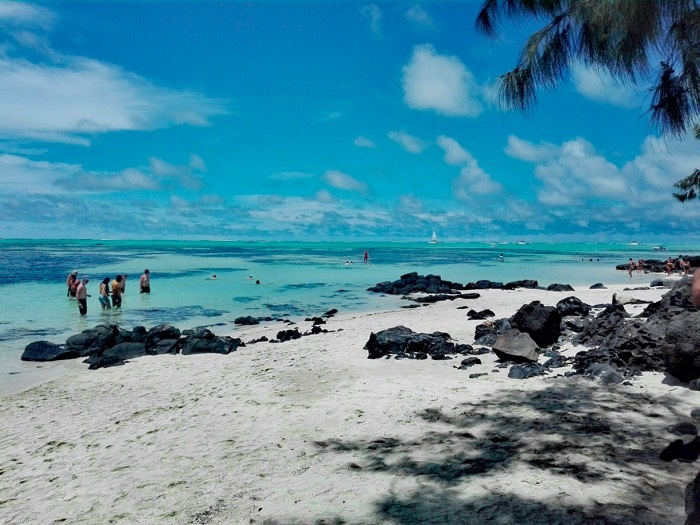 It is possible to book your trip to Ile aux Cerfs online, DON’T !! 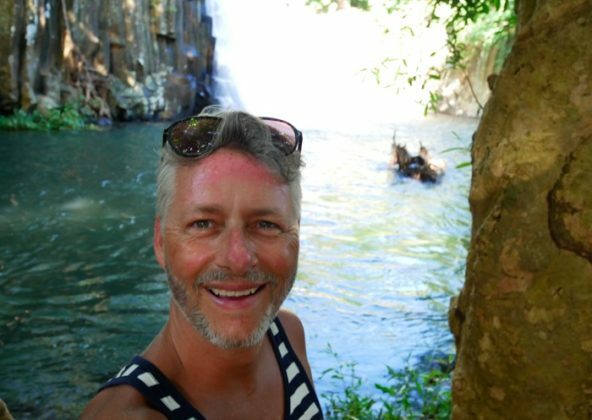 You will save a lot of money doing your bookings at one of the many tour-operators found throughout the island. 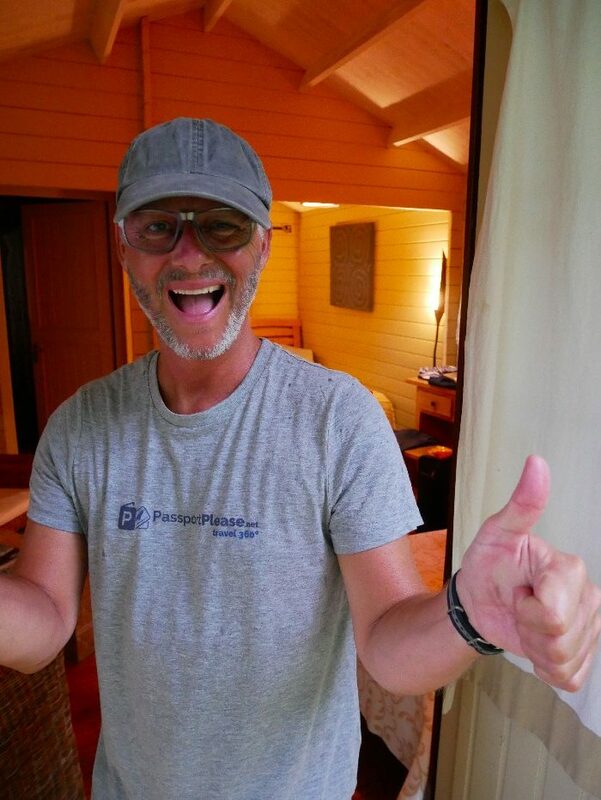 We used Fragawills in Flic en Flac and it only set us back 38 euros pr. person. Bye Bye tropical dream-like paradisiacal Mauritius. Hopefully, we will meet again. Mauritius is an absolutely amazing experience. We hope we have inspired you to visit someday. Always have some cash with you, they don’t accept credit-cards everywhere. 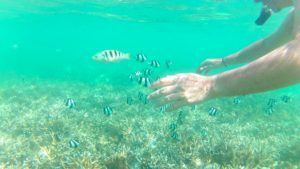 Wear swim shoes, there are lots of corals and sea urchins. We rented this 80 square meters large top floor air-conditioned apartment through AIRBNB at a very reasonable price. The apartment holds two bedrooms, two baths and one toilet. The kitchen is well equipped and you have all you need. There is a large rooftop terrace overlooking Flic en Flac. 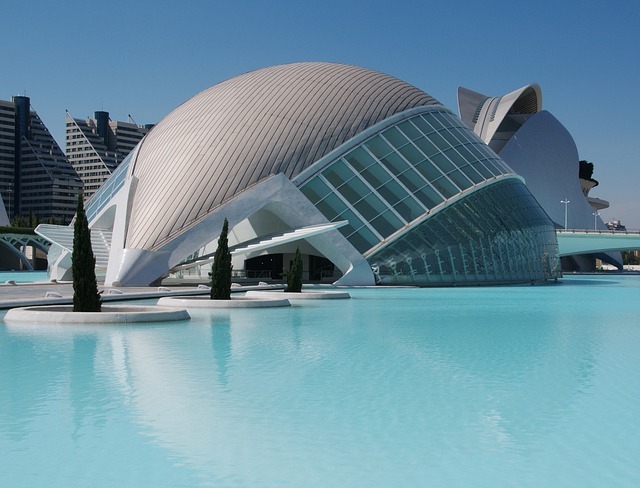 You reach the beach, shops, supermarket and restaurants within 7 minutes on foot. Shayama who owns the apartment is very attentive and her housekeeper, Gina can be reached by phone anytime. There is a large patio with sun loungers and integrated pool on the first floor. The furniture on the rooftop terrace needs replacement and the internet isn’t too reliable but all in all you get good value for your money. Location is excellent. Le Jardin de Beau Vallon is an absolute gem. 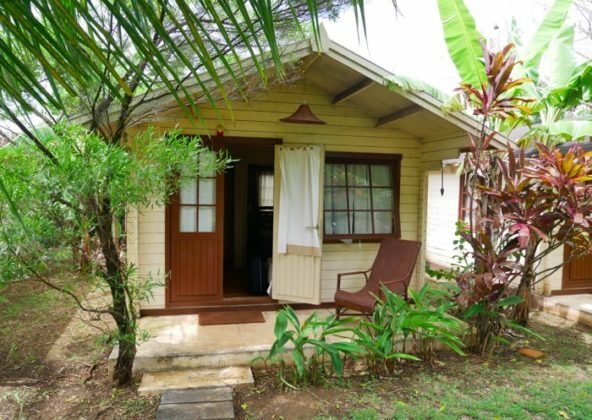 A small guest house with only 5 cabin-like small wooden cottages located in a very well maintained beautiful tropical garden. 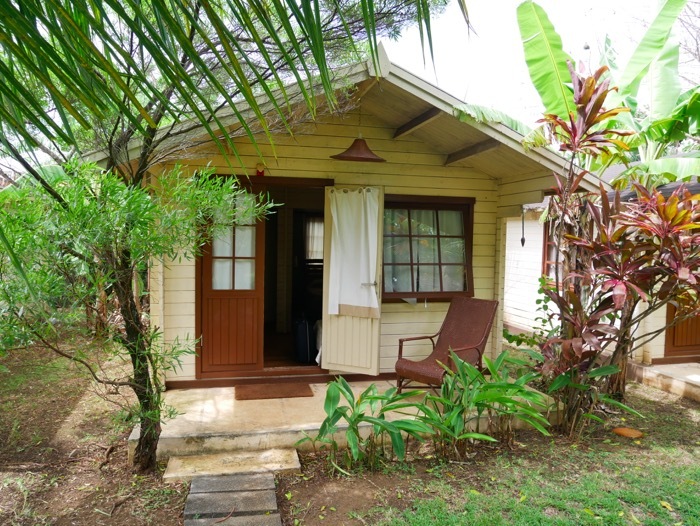 The cottages have air-conditioning, wifi, a fridge and a small patio. There is a little pool in the garden and sun loungers. Location is superb. 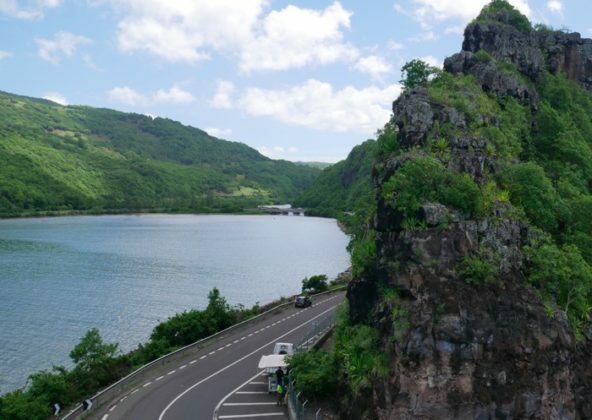 Within 5 minutes you can reach Blue Bay by car and the airport is only 10 minutes away. 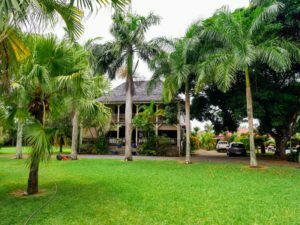 The main house is a beautiful old colonial style wooden building and holds a very lovely, charming and stylish restaurant. The restaurant serves immensely delicious food. While enjoying a very tasty dinner and drinking good wine you can listen to an extremely well-playing guitar duo. The restaurant at Le Jardin De Beau Vallon produces magic. Upon departure when you are presented with the total bill including your accommodation you might think there has been a mistake. Prices are ridiculously low. 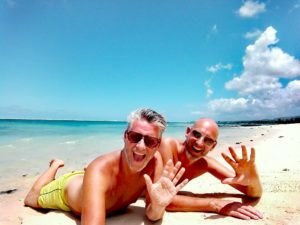 We didn’t feel unsafe one single moment during our stay in Mauritius. Mauritius seems to be a very safe and secure society. People are generally friendly, smiling and helpful.But like in any other place you have to use your common sense, of course. 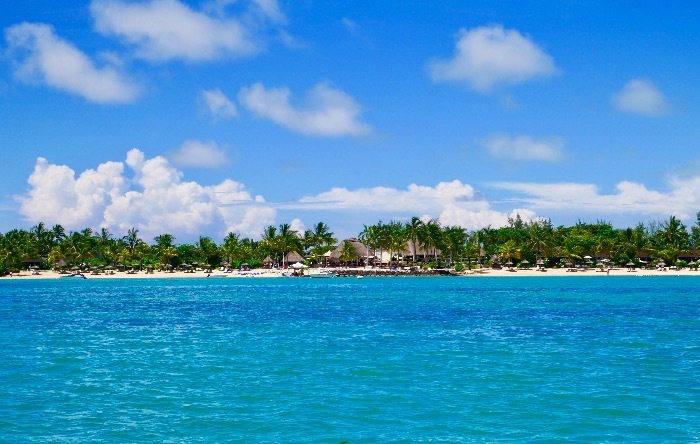 Mauritius is amazing and will treat you well! You definitely should visit some day. Wow such an informative post! And your tips are very useful, especially on how to save money. I am also impressed about the local buses routes names! Thanks for sharing! Thank you so much. We are glad if we could give helpful informations. Mauritius is a wonderful experience. Feel free to ask if you have any questions.